Andres Herkel: Who Are the Political Prisoners in Europe? 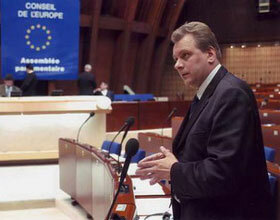 The text was prepared for the Fallen Freedom Fighter’s Day conference in Tartu on 25 March 2012. Some days ago I was in springtime Oslo. The conference was dedicated to the situation in Belarus and it was organised by the Norwegian Helsinki Committee in cooperation with the Norwegian PEN Club. At the dinner, one of the hosts had tears in her eyes. Why? The lady said that nothing at all would change, people were suffering. And not only in Belarus. I could not comfort her in any other way but by saying that history is full of indescribable horrors. World War II, deportations, suffering and death in GULAG. Fortunately the horrors of today are not on that scale. When I had arrived home, I changed from my usual suit and tie to a T-shirt I was given in Oslo, with the message “Freedom for Ales Bialiatski“. As I am writing these lines, the picture of Ales’s face is on my chest and the text is on my stomach. Last year I met Bialiatski himself in Norway, now I was given a T-shirt requesting his freedom. Ales was arrested in August last year. In autumn he was sentenced to prison for four and a half years for alleged tax evasion. Money for supporting Viasna Human Rights Centre led by Ales had been transferred to his private bank account. As Viasna could not operate freely in Belarus or have a bank account, there was no other possibility for supporting the organisation. Amnesty Internationalimmediately declared Ales Bialiatski a prisoner of conscience. As the activities of Ales Bialiatski in defending human rights have been noteworthy, many parliamentarians across Europe have supported nominating him for the Nobel Peace Prize. What is the difference between a prisoner of conscience and an ordinary political prisoner? The easiest definition of a political prisoner is that somebody is in prison because he/she is against or criticises the government of his/her country. It is not always easy to define it, because often some other article of law is used for conviction, there may be selective administration of justice or even clearly artificial charges. For example, one of the typical patterns is “discovering” drugs in the pocket of an arrested dissident. Prisoners of conscience are the people who have been deprived of their freedom because of expressing their convictions. However, there is a clause that these convictions should be peaceful and not call to support violence. Those who try to overthrow the government in cooperation with the intelligence service of another state are also excluded. Thus the activists of Nochnoi Dozor, if their guilt in causing the so-called disturbances of the Bronze Night had been convincingly proven, could not in any way have expected to get the status of prisoners of conscience. Besides politicians, religious people can also be prisoners of conscience when they refuse, because of their convictions, to fulfil an obligation imposed by the state if their religion does not allow it. The notion of ‘prisoner of conscience’ was initiated in 1961 by the British lawyer Peter Benenson. He also launched the campaign Appeal for Amnesty 1961. This grew into the influential human rights organisation Amnesty International. Although the organisation has expanded its original principles in the course of time, and we may not like at all their criticism against the Estonian language policy, the request to free prisoners of conscience also today forms the core of the activities of Amnesty International. There are about ten prisoners of conscience in Belarus. For example, last year reporter Iryna Khalip was a prisoner of conscience in house arrest, now she has certain right of movement. Let’s say she is a prisoner of conscience on parole. Iryna’s husband Andrei Sannikov, candidate at the presidential elections of 2010, is in prison where the conditions are very hard and everybody is worried about his health, except the Government of Belarus. Actually Iryna, too, was in prison in the beginning, but as she and Andrei have a small son who was left in the care of his aged grandmother, the international pressure became so forceful that the authorities decided to suspend her punishment. For many months she had to stay in her apartment totally incommunicado, she could not even go near a window. Belarus is generally recognised as a pariah state, and the prisoners of conscience there confirm that status. On the other hand, there should be no political prisoners, not speaking of prisoners of conscience, in the Member States of the Council of Europe. But actually it is not so. The highest score there belongs to Azerbaijan who according to Amnesty International at present has fourteen prisoners of conscience. These are comparatively new cases – in their blogs and public speeches these people have criticised the authorities and called people to demonstrations. Here I would like to call upon all good-willed people to join the appeal that when the journalists from Estonia and especially the Estonian National Broadcasting go to Baku in the end of May, they would not forget to pay attention to the situation of political prisoners and the essential lacking of political pluralism in Azerbaijan. These issues should not be forgotten because the privilege we have to live in the free world really obligates us to do something. We should never forget the sufferings of others. There are no such bright stars among Azerbaijan’s political prisoners of today as the charismatic reporter Eynulla Fatullayev who was freed after international pressure in May last year. I have described him in my book “Letters from Azerbaijan” (2010) which I wrote on the basis of my experience as a rapporteur. Of the new prisoners, maybe the most outstanding is Tural Abbasli, 29-year-old reporter and blogger, head of the youth section of the Müsavat Party. First of all, it is noteworthy that so many young activists have been isolated from the society. Former government ministers Farhad Aliyev and Ali Insanov are also political prisoners in Azerbaijan, although they have not been declared prisoners of conscience. Two long-term prisoners of Russia, Mikhail Khodorkovsky and Platon Lebedev, have now also been promoted to the status of prisoners of conscience. Khodorkovsky is the most famous of the two, but essentially we are dealing with parallel cases. Maybe Lebedev was at first arrested to give Khodorkovsky a sign to leave the country. Khodorkovsky stayed. In 2005 both men were sentenced to nine years in prison, but in 2011, when they became eligible for parole, 12 years were added to their punishment with new accusations. After that Amnesty International declared them both prisoners of conscience. Besides that, political leaders like Boris Nemtsov and others have been detained in Russia for short terms. As Amnesty has reacted quickly to these cases, it can be said that the list of prisoners of conscience in Russia has usually 2+x names, and at present x equals zero. The third Member State of the Council of Europe that produces prisoners of conscience from time to time is Turkey. Mostly these cases are connected with conscientious objection or members of the Kurdistan Workers’ Party. The issue of imprisoned politicians in Ukraine is more and more on the agenda. Until now, it has been tried to avoid calling the former Prime Minister Yulia Tymoshenko and former Minister of Internal Affairs Yuriy Lutsenko political prisoners in official documents. The representatives of Amnesty International also say that at least now they have no grounds for declaring the former Ukrainian politicians prisoners of conscience. At the same time the fact that the political motive is clearly visible in the activities of both the investigative bodies and the courts cannot be missed. When one case against Tymoshenko was closed, another was immediately started so that there would not be even the shortest period when she could have communicated freely with the outside world. In Armenia, there were tens of political prisoners and many people were killed after the last presidential elections in 2008. By now the problem of prisoners is solved, but in the beginning of May there will be parliamentary elections. In the past, elections have been a risk factor in Armenia. And in conclusion, an example from a faraway land. How full of exceptions the circumstances relating to political prisoners can be may be seen from the life of the eleventh Panchen Lama Gedhun Choekyi Nyima, who was born in 1989. He was separated from the world as a six year old boy, received the status of the youngest political prisoner in the world and now, when he is grown up, he is still in house arrest. Not all prisoners of conscience are freedom fighters in the direct sense of the term. The freedom to request alternative service to military service for religious or other reasons is not fighting for freedom. Our Jüri Kukk certainly was a prisoner of conscience and a freedom fighter. Several people who spoke at Jüri Kukk Memorial Conference today – Enn Tarto, Mart Niklus and Kalju Mätlik – have the same status. They deserve great respect for what they have done. And fortunately in Estonia of today we are speaking of political prisoners only in retrospect. In a democratic country people criticise the politicians but in an authoritarian state the government and official propaganda criticise the prisoner of conscience. Outside his/her homeland or among the opposition of his/her country, a prisoner of conscience may be very much respected. But the deserved official approval comes only after the system of government has been radically changed. Fortunately this is what happened in Estonia.